Fort Worth and Tarrant County have a terrific evening planned March 3, when Harriette and Arnie Gachman will be presented with the Manny and Roz Rosenthal Spirit of Federation Award at the Federation’s Annual Big Event. The entertainment should be fantastic as well with comedian Joel Chasnoff followed by a culinary demonstration by Israeli-born restaurateur Einat Admony. I remember hearing Joel Chasnoff for the first time about 15 years ago. He was the featured entertainer at the American Jewish Press Association’s annual conference. He is funny. And, from what I hear, he’s refined his act over the years and it’s only gotten better. In November he appeared at a sold-out Shearith Israel Sisterhood fundraiser in Dallas and received rave reviews. I can’t think of anyone more deserving of the Manny and Roz Rosenthal Spirit of Federation Award than Harriette and Arnie Gachman They are mensches defined. Read on for more details. Do you like to laugh? Do you like to eat delicious food? Of course you do, so make a point of going to Belly Laughs, Comedy that Cooks! At 7:30 p.m. Saturday, March 3, come to Beth-El to celebrate the Jewish Federation’s 2018 Annual Campaign Big Event! Be entertained by Israeli-born restaurateur Einat Admony, the owner of four New York City restaurants who’s won the TV show Chopped! twice, and Texas-born comedian Joel Chasnoff, who served in the Israeli army and wrote a best-selling memoir about it. During the event, the Federation will honor Harriette and Arnie Gachman with its most prestigious honor, the Manny and Roz Rosenthal Spirit of Federation Award. On April 7, 2016, with the support of the Rosenthal family the Federation presented the Manny and Roz Rosenthal Spirit of Federation Award for the first time. This award was created to honor the Rosenthal family’s long-standing dedication to the Fort Worth Jewish community’s well-being and its first honorees were Roz Rosenthal and Lou Barnett. Last year, the Federation honored Marcia Kurtz with this prestigious award. This year, the Jewish Federation honors the steadfast leadership of Arnie and Harriette Gachman. When asked what receiving this award means to them, Arnie shared, “Our community leaders realized that to sustain Federation is to preserve Jewish values, culture and tzedakah. “Harriette and I have learned from your past honorees and many other wonderful contributors of past generations the need for Federation. The result is a Federation that touches every Jewish person and many others in Tarrant County every day. Simply, the modern model not only helps Jewish needs around the world; it supports needs in our own community. 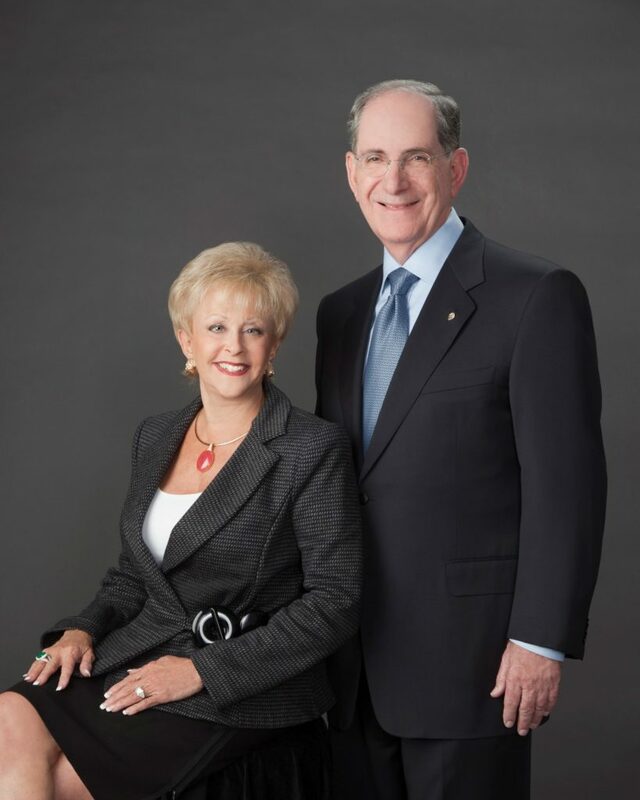 The Fort Worth Jewish community is indebted to Arnie and Harriette for the leadership that they have given, and continue to give, to its Jewish community. “We are thrilled to honor them with this special award. Please join us March 3 at Belly Laughs to help us say thank you,” said Bob Goldberg, Federation executive director. The 2018 Annual Campaign Big Event, Belly Laughs is Saturday, March 3, at 7:30 p.m. at Beth-El Congregation. Tickets are $18 per person. RSVP by calling the Federation office at 817-569-0892 or email Cindy Simon at c.simon@tarrantfederation.org or go online to https://www.tarrantfederation.org/2018-annual-campaign. Event co-chairs are Federation President Diane Kleinman and Campaign Co-chairs Cheryl Visosky and Robert Simon, who have been working diligently to plan a fabulous evening. 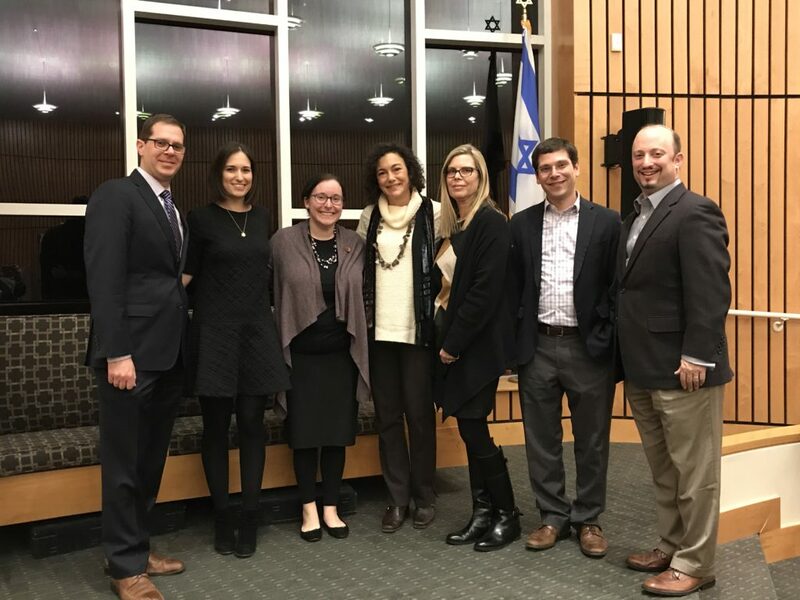 On Feb. 5, the Dallas Community iEngage Initiative welcomed Hartman Scholar Dr. Elana Stein Hain for a community lecture at Congregation Shearith Israel. Dr. Stein Hain, who brilliantly addressed the topic “On American Jewry’s Israel Conversation: Between Prophetic and Rabbinic Politics,” is scholar-in-residence and director of faculty at the Shalom Hartman Institute of North America. Stein Hain earned her doctorate in religion from Columbia University, and is a graduate of the Yeshiva University Graduate Program in Advanced Talmudic Studies and the Cardozo Interdisciplinary Fellowship in Jewish Law and Legal Theory. She has served as clergy member at Lincoln Square Synagogue and The Jewish Center, and as a member of Wexner Institute faculty. She co-founded the Orthodox Leadership Project (OLP) to support female leaders working in the Orthodox Jewish community, and was recognized by The Jewish Week in its inaugural “36 under 36” as an emerging Jewish leader. The Dallas community iEngage Initiative is a grassroots consortium (comprising Adat Chaverim, Anshai Torah, Beth Torah, Shearith Israel, Temple Emanu-El, Temple Shalom and the JCC) and is a direct outgrowth of Rabbi Donniel Hartman’s powerful talk in Dallas in May 2017. The Shalom Hartman Institute’s work on transformative thinking and teaching addresses some of the major challenges facing the Jewish people in Israel and around the world and encouraged a group of local rabbis and educators to gather and plan a communitywide approach to Jewish values–based education about the Israeli-Palestinian conflict. Using the Hartman Institute iEngage materials, the consortium has created a context for genuine Israel engagement across denominational, generational and geographic divides. In October, 100 students began studying a 12-week curriculum together with five rabbis in three locations across our community. Current faculty are Rabbis Nancy Kasten, Michael Kushnick, Andrew Paley, Adam Roffman and Elana Zelony. The consortium will be meeting soon to plan future course offerings. Diane Benjamin, Republican Precinct #2021 chair for Preston Hollow, hosted a table at the recent Reagan Day Dinner with special guest and keynote speaker, Vice President Mike Pence. Senator Ted Cruz spoke as well. 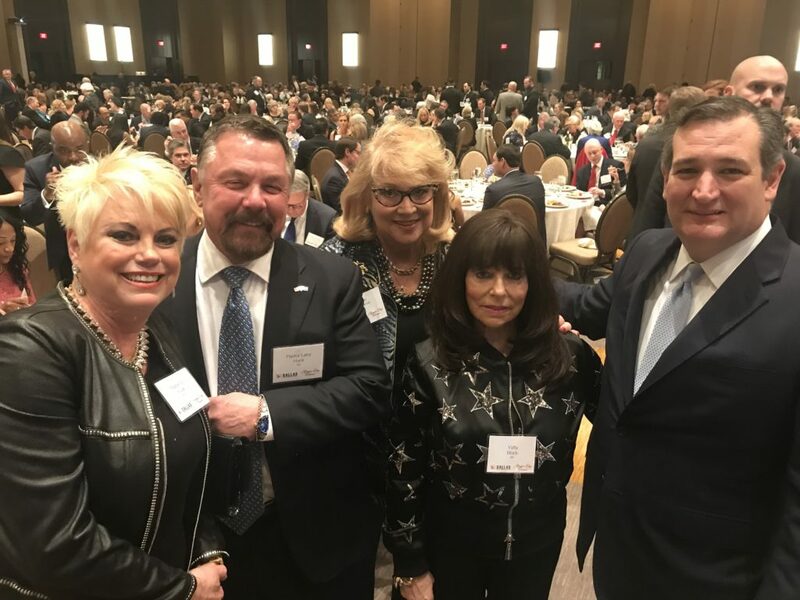 Diane, who is also president of the Texas Region of Bnai Zion Foundation, was touched when Senator Cruz recalled that his father, Pastor Raphael Cruz, was also a former honoree of Bnai Zion, for his special friendship with Israel, as a strong Christian Zionist. The event was a successful fundraiser for the Dallas area GOP. The Dallas County GOP chair, The Honorable Missy Shorey, also announced her pride in her husband, Lt. Colonel (Ret) Marc Himelhoch, who is a member of the Dr. Harvey J. Bloom Post #256 of the Jewish War Veterans of the USA, currently a pilot for Southwest Airlines, but formerly having flown F -16 aircrafts for the USAF. Pastor Nancy Cole commented on how wonderful it is to share love for Israel and political passions as well as strong convictions for the welfare of our country. Diane appreciated the opportunity to host dear friends and strong Christian Zionists who are true leaders of their flock in deeds as well as words. Seated at Diane’s table were distinguished guests who were former honorees of Bnai Zion Foundation, Pastors Larry and Tiz Huch of the New Beginnings Church in Bedford, Texas, along with Pastor Nancy Cole and former Bnai Zion honoree and area representative of American Friends for a Safe Israel (AFSI), Ann Stacy, and her husband, John. Additionally, Diane’s table guests included Dr. Lionel and Gloria Reiman and Raphael and Yaffa Bloch. Vice President Pence spoke to a captive audience of over 1500 and received a standing ovation when he mentioned the commitment of President Trump to move the United States Embassy to Jerusalem. 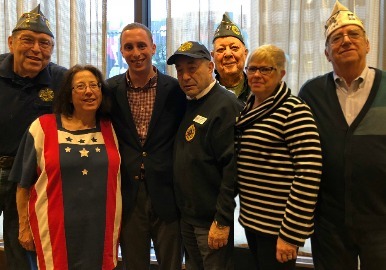 While in Washington, D.C., at the Jewish War Veterans National Executive Committee meeting, members of the Dallas/ Fort Worth delegation were surprised to see Plano native and member of Post 256 Dan Rosenfield as one of the panelists discussing Jews in the military and issues surrounding them. The four panelists consisted of active duty member Dan Rosenfield (son of Andi and Stuart Rosenfield), a female chaplain, a wife of an active duty member, and a member transitioning out of active duty. Dan graduated from Texas A&M in May 2017. At A&M, he was a member of the Corps of Cadets, Hillel president, Student Government Association executive vice president, and a founding member of AEPi and Aggie Students Supporting Israel. He is a public affairs officer for the U.S. Air Force and is stationed at Ellsworth Air Force Base in South Dakota. What a season for Akiba hoops! 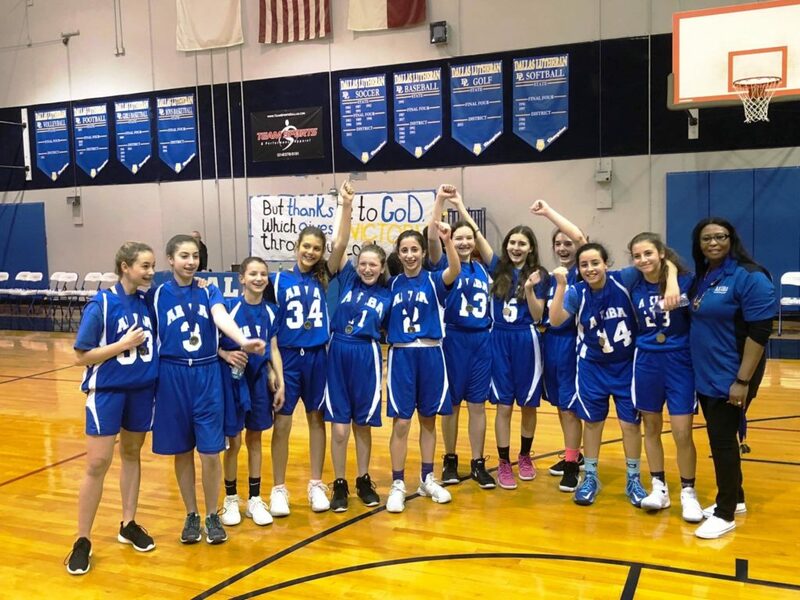 Seventh- and eighth-grade girls’ and boys’ basketball teams swept the TAPPS 3-AAA playoffs recently, taking home the district championships. This marks the second year in a row that the girl’s team won the district championships. This year, the girls were in fourth place in the district before they beat The Covenant School and clinched the top spot. Following the girls’ game, the boys celebrated their undefeated season with a championship game win over Ovilla Christian School. Dallasite Karen Katz grew up shopping at NorthPark Center, and her lifelong shopping spree at Neiman Marcus began there when she was a teenager. Those teenage shopping years led to her ascension to president and CEO of the upscale department store in 2010. But Katz announced in January that she would step down from those roles, but remain an active member of the board of directors. Katz joined the company in 1985 as a merchandise manager of the Neiman Marcus Town & Country store in suburban Houston. From that small store, she began her move up the proverbial corporate escalator. 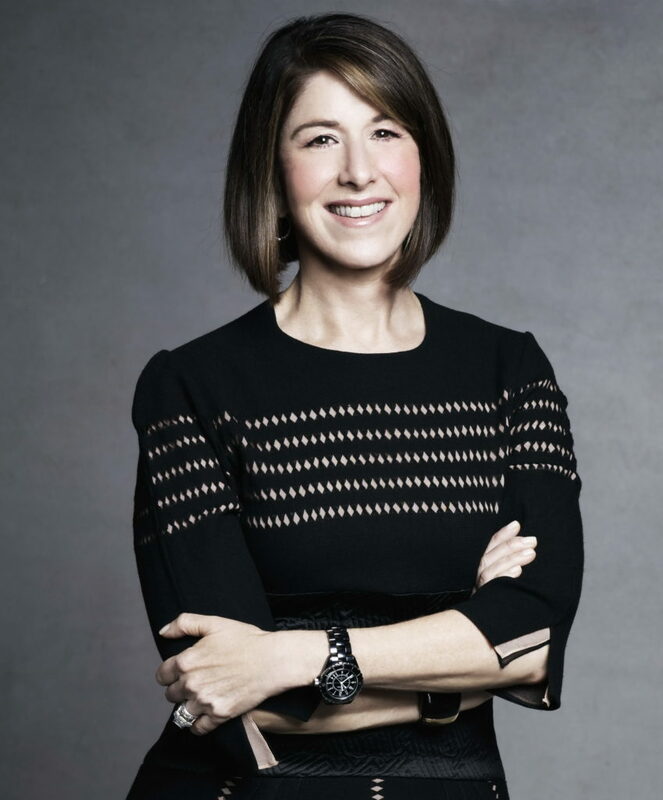 She was appointed president and CEO of the Neiman Marcus Group after serving in several executive-level positions, including president of Neiman Marcus Stores and Neiman Marcus Online. During the early 1990s, Katz was vice president and general manager of the company’s top-volume store in the chain at NorthPark Center — the store in which she had always loved to shop. Years before, when considering how she would put her education to work, she mulled over going to business school to earn an MBA. At times, she toyed with the idea of becoming a lawyer. Ultimately, she realized she just needed a job and pursued a career in retail. After graduating from The University of Texas, she applied to both Foley’s and Neiman Marcus’ merchant training programs. It was Foley’s, now a division of Federated Stores and parent company of Macy’s, that hired her. Ironically, Neiman Marcus turned her down. She called her subsequent success with Neiman Marcus “sweet revenge.” Her Neiman Marcus career spans 33 years — about half of her life. Katz grew up in Preston Hollow, where she attended Thomas Jefferson High School. She and her husband, Alan, moved back to Dallas from Houston. He is in the oil industry. They have a son, Alex, who lives in San Francisco. “Presently he is starting a company focusing on making access to mental health options easier. Alan and I are very proud of him,” she said. Neiman Marcus Group is a $5 billion company that operates several successful luxury retail e-commerce sites, as well as 42 Neiman Marcus Stores, two Bergdorf Goodman stores in New York, and MyTheresa, based in Munich, Germany. The company has a complex network of luxury vendors. However, it is their “worldly and wired” customers who are the focus of everything it does. In reflecting on her long career, Katz credits working with strong mentors. Beyond developing and mentoring the team and growing the business, Katz believes another of her enduring contributions is the company’s commitment to philanthropy through the Heart of Neiman Marcus Foundation that supports youth arts education programs. In 2016, donations from the Heart of Neiman Marcus Foundation impacted over 1.2 million young people, and by 2017 the company’s support had increased to more than 2 million people’s lives touched and changed for the better through the company’s efforts to support the arts. “I think that having grown up in a strong Jewish family, you become instilled with the commitment to give back to the community, and to be respectful of every part of the community.” As an extension of her commitment to tzedakah, Katz was instrumental in creating the All Heart Fund, part of the Heart of Neiman Marcus Foundation, which is funded by employees for employees facing hardships and to support disaster relief efforts. Katz juggles her various business, community and family endeavors by making lists. She revealed other recommendations for staying true to yourself and on track with goals — whether personal or professional: “Manage your personal brand. Stay true to your values. Use social media. Work hard. The adage ‘The harder I work, the greater my luck’ has proven to be true in my experiences. “I have always worked very, very hard,” Katz added. “I believed that working hard trumps a lot of things. Working hard is part of your own personal brand. I have every intention of working as hard in this next chapter of my life as I did during my retailing career. The biggest night in Yavneh girls’ basketball history wasn’t supposed to even happen, at least not this year. On Tuesday night, the Yavneh girls’ team opened a playoff doubleheader with the boys’ team, thanks to the kindness of their opponents. The game took place after press time. The boys’ team (29-0) played Watauga Harvest Christian (12-13). “This game was supposed to be neutral against Amarillo Ascension Academy. Their athletic director called me up, and we had this amazing conversation where he said he knew how much this meant to our community,” said Yavneh Athletic Director and Boys’ Coach David Zimmerman. As a result, the Cardinals (13-8) came to Dallas, giving Yavneh’s girls team its first-ever playoff home game and a chance for all-time leading scorer Anna Wernick to play before the home crowd one more time. Getting to the playoffs in the first place, and especially as a reasonably high seed, was a huge deal in itself. The Bulldogs struggled mightily to win games just a few years ago. This time around, they went 17-11, including 10-2 in district play to earn a co-championship. They lost the tiebreaker for hosting a game. That was after the graduation of their longtime leader, Jacquie Mitzner, and after an injury to up-and-comer Jenna Sasson, who tore her ACL just a few games into the season. The Bulldogs had to find their voice through trial and error. “It took a little while. The leadership, some of the games we dropped early, were trying to figure those things out,” Martin said. The Bulldogs managed to go 4-4 to start the season. But then came the Weiner Memorial Tournament in Baltimore. Yavneh finished third, but got a lot more out of it than a few wins. Martin said Wernick and sophomore Jessica Lampert, the team’s second leading scorer, were learning how to adapt to coaching critiques and started communicating better with their teammates. As a result, other girls started to step up their game and become better leaders, notably senior Rachel Sasson. “It’s been more of a group effort this year. They are not only leading with words, but with actions,” Martin said. Following the tournament, the Bulldogs had a solid run through the district, including eight straight wins. Martin said adjustments to their defense made during the tournament helped. Along the way, Wernick became the program’s first player to reach 1,500 points. She averaged 15.8 points, 5.8 rebounds and 3.5 steals. Lampert is averaging 8.3 points, and freshman Liel Guttman averaged 4.8 points, 3.7 rebounds and 1.9 blocks. The defense is what drives this team. Wernick and senior Jordyn Lax were there when the team was at a low point. “They’ve been though the days of ‘Are we ever going to win a game?’ to getting a home playoff game,” Zimmerman said. 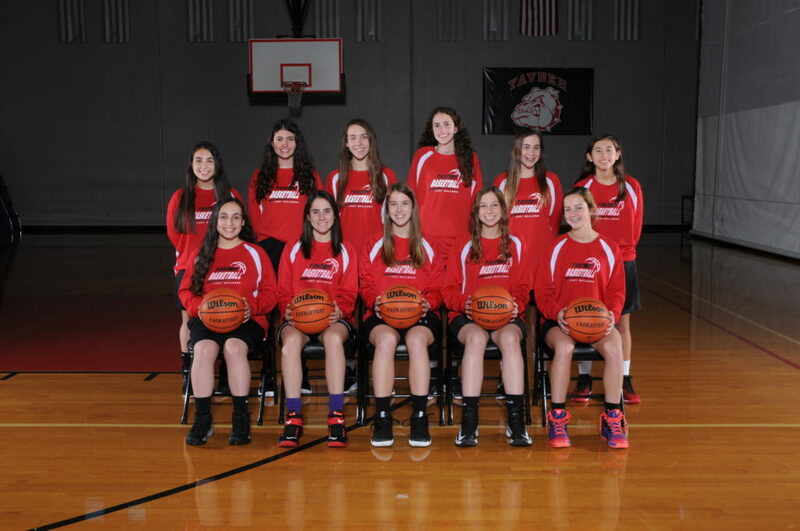 Last year, Yavneh made the playoffs for the first time, going 11-16. “We played Midland Classical, one of the top girls’ programs in the state,” Martin said. “They overwhelmed us. A big part was our lack of experience. But it was a great experience going into this year, because we were able to build off it. Because Ascension is from Amarillo, they have no common opponents. Martin knew little about them, except that the team has six players on the roster. That will change in the next round. “If we are fortunate enough to get past them, our next opponent will be from the area,” he said. The winner of the Yavneh-Ascension game will play either Denton Calvary (20-8) or Dallas Covenant (12-11). Covenant and Yavneh each beat the other team on their home court. Martin said his team was a little too caught up with its offensive struggles in the first game and relied more on its defense in the second game. “Anything can happen at any time. But we’re a good defensive team, so if we hang our hat on that, we’ll be in games,” he said. Either way, this has been a tremendous success for Yavneh. “It shows this is a good, hardworking community that can do this not only in the classroom, but put a great product on the court. The Yavneh boys are an outstanding program. David does an excellent job. For my girls, they want that, too. They want people to show up and cheer for them, and to be respected also. This game, for us, is such a good feeling and moment of accomplishment,” Martin said. For updates on Yavneh’s playoff run, visit tjpnews.com and the TJP Facebook page. Yavneh Academy’s boys’ basketball team entered the season with the highest of hopes, having come to the precipice of a title in 2017 before falling in double overtime of the TAPPS 3A championship game. 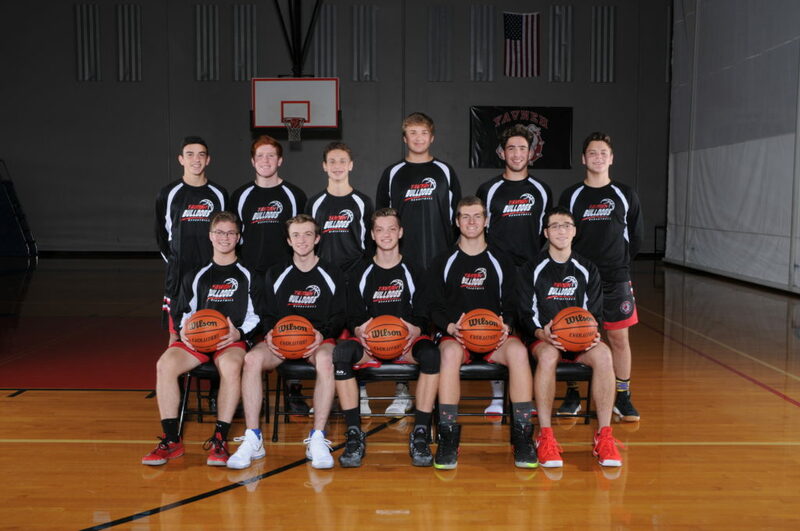 This season, Yavneh went 29-0 in the regular season before opening its playoff run Tuesday night (after press time) in the area round against Watauga Harvest Christian (12-13). That game was part of a home playoff doubleheader with the Yavneh girls team (17-11), which faced Amarillo Ascension (13-8). The winner of the boys’ game will play the winner of Tuesday’s game between Willow Park Trinity Christian (20-8) and Midland Classical (15-16) Saturday night at a neutral site. The bracket could lead to a championship-game rematch of last year’s final against Kerrville Our Lady of the Hills (25-6). “There’s an incredible amount of excitement in the community,” said Yavneh Athletic Director and Boys’ Coach David Zimmerman, who called the boys’ and girls’ playoff doubleheader a dream come true. Led by the high-scoring trio of junior Ofek Reef (18.9 points per game) and seniors Griffin Levine (17.2) and Pierce Bell (12.7), the Bulldogs feature a deep bench and fast-paced approach. But as high as expectations were for his team this year, Zimmerman knew nothing was guaranteed. The approach to getting back to a title run has been about beating more than just the other team. “Our whole focus has been ‘Get better every day.’ Can the Yavneh team that steps into the locker room be better every night, and beat the Yavneh team from the night before?” Zimmerman said. After a while, that unblemished record makes it harder to keep focus. “I think a message I’ve even had to tell myself this year and to get the kids to buy into, is to enjoy the journey a little bit. I’m as guilty as anybody, because it’s such a blur and has gone so fast,” Zimmerman said. Nobody loses focus when they play Yavneh. That’s why even wins by large margins have been helpful, Zimmerman said. One of the first close calls was a 71-63 victory against Sunset Nov. 21. The biggest challenges, though, came during the Weiner Memorial Tournament at Beth Tfiloh in Baltimore, which featured seven games over four days in late November and early December. The first game was won, 46-39, and after two games with a little more breathing room, the Bulldogs edged Jerusalem-based Boyar, 37-36. After a seven-point win, Yavneh again beat Boyar, this time 60-44. The title was claimed in a 17-point win against Heschel. “They had a lot of talent, a lot of size, probably the most we played against this year,” Zimmerman said of Boyar. Yavneh opened district play with an 85-6 victory against Cristo Rey, and kept rolling. Although the closest league game was decided by 13 points (at Covenant Jan. 6), Zimmerman said the final scores were sometimes misleading. A game against Highlands was tied at halftime. “I don’t think anyone on this team is believing we’ll just go through the playoffs and win every game by 15 points or more. I don’t think anyone’s preparing that way,” he said. This was the sixth straight 20-win season, making it less of a surprise that the Bulldogs were able to stay strong after graduating Noah Rubinstein and Daniel Chernikov from a 31-4 squad. In addition to their scoring abilities, Reef averaged 9.5 rebounds, 4.1 assists and 3.7 steals; Levine 3.5 rebounds, 5.7 assists and 2.4 steals; and Bell 5.4 rebounds, 2.5 assists and 2.1 steals. Levine has hit 43 three-pointers, and sophomore Tyler Winton added 31. But opposing teams trying to focus on a handful of players will find themselves in trouble. This year, though, Zimmerman found himself with a bench full of players who could contribute much more than a breather for his starters. He limited most of his starters to 23 or 24 minutes per game so the backups could get serious game time. It also helps with their style. “We’re very fast-paced. We put a lot of pressure on you, but we can play a number of different ways. In order to play the style we do play, you have to be in great shape,” he said. In terms of player leadership, Levine and senior Micah Romaner are captains. “It’s not hard for guys to look up to Griffin because he’s a gym rat, one of the top players in the state, a captain for the USA team at the Maccabiah games. He’s a leader, but I think he leads far more in how he plays on the court,” Zimmerman said. Harvest Christian defeated Dallas Lutheran 40-31 in the opening round. Dallas Lutheran lost to Yavneh by 19 and 20 points in district play. Yavneh beat the Saints in a game last year. Why are the Jewish people called the Chosen People, and not the Chinese, Hispanics or Christians, for that matter? Before we ponder why we are called the Chosen People, let us first consider what it means to be “Chosen.” Chosen for what? What does Chosen entitle us to? This blessing is predicated upon the concept that we are, indeed, Chosen. It also defines that Chosenness: We were chosen to be the recipients of God’s Torah. As recipients and custodians of God’s Torah we were given a mission — that of “light unto the nations” (Isaiah 49:6). The word “Torah” comes from the root orah, which means light or illumination. Carrying the message of Torah to the world illuminates the entire world with the will of God. The Jews have done just that throughout the generations by introducing to mankind the concepts of monotheism, the precepts of the Torah as they apply to the world at large (and, of course, bagels, lox and guilt). The Talmud explains that the Torah was first offered to the other nations of the world, to give them a chance to be the receivers, before finally offering it to the Jewish nation. One by one, they turned it down after asking what it says and finding it unsuitable for what they considered their role in the world. The Jews accepted it unconditionally, out of the love and trust in God that was handed down by the patriarchs and matriarchs, and thereby became the Chosen People, entrusted with instructing the world in God’s design and purpose to creation and life. This Chosenness comes with many obligations, together with its “perks” of special endearment and closeness to God, by fulfilling the charge we have been entrusted and empowered to fulfill. It is a concept that has, sadly, been largely lost to today’s generation of Jews. The loss of this awareness is probably the single greatest cause for the widespread assimilation we are witnessing today. The key antidote for assimilation is a deeply felt Jewish pride in what we are and what we represent. Only with the notion of Chosenness can we truly perpetuate that pride and the dedication that goes with it to ensure marrying Jewish and remaining involved in the Jewish community. Without Chosenness, we are, with the nations, all essentially the same in our purpose in this world. Hence, sadly, many feel there’s no reason to remain Jewish. The morning Torah blessing teaches that through study of Torah we retain that connectedness and Chosenness — and hence — Jewish continuity. Rabbi Yerachmiel Fried is the dean of Dallas Area Torah Association (DATA). First, it was Columbine in 1999. Thirteen dead. Thirteen years later, 26 dead at Sandy Hook. Last week, Parkland, Florida: 17 dead. In the interim between first and most recent (I’m afraid to say “last”), there have been 25 school shootings in our beloved country. Last Saturday’s Dallas Morning News proved without having to say so that at least two of the most recent victims were Jews. We know because their funerals were reported on the front page: Alyssa Alhadeff, age 14, at Star of David Chapel; Meadow Pollack, 18, at Temple Kol Tikvah. We know because they were buried first, because we Jews do not wait to inter our dead. Who can imagine the unfulfilled plans, the future dreams their loving parents buried with them? We are readying for Purim, eager for our annual romp, a time of costumes and groggers, of honoring Esther, that most reluctant of heroines, the queen who saved her people. Our people. How can the families of those two martyrs make merry? They will be welcomed as mourners into their separate congregations tomorrow evening; they will join in the welcome of the Sabbath Queen. Maybe they will be thinking, as I am now, that their daughters might have grown up to be queens themselves. Perhaps they too might have been brought to high estate at some time in their future lives, as Mordecai reminded his niece that she had been, for something great, something important, something of benefit to many people. About these two, we will never know. When children die before their parents, their futures are forever unknown; left are only tears, and “why’s” and “what if’s” — all those great questions for which there are no answers here on earth. Potentials unexplored. Achievements unrealized. Never to be mended holes in the hearts of their loving families. But we should consider this, especially at Purim this year: There have been other Esthers in our Jewish history, other women who may not have saved an entire people, but who have contributed to the betterment of many, in many ways, in many fields of endeavor; right here in our country, called on in their varied, different lives, they have done so, and they are still doing so. This is something we might all think about as we boo the villain Haman and cheer our heroine Esther. Ruth Bader Ginsburg is an Esther. Natalie Portman is an Esther. Aly Raisman is an Esther. And Gabby Giffords is an Esther. Just a few of the Jewish women in our own time and place who have stepped forward — albeit often reluctantly — to stand proudly as forces for real good. Ginsburg, the living symbol of law in the highest court of our land. Portman, portraying the iconic Jackie Kennedy on the big screen and in the process becoming an icon of sorts herself. Raisman, speaking out on behalf of many abused after years of painful silence — the speaking out in its way even more painful than the silence. And Giffords, who by all rights should have died from the shot to her head, but has lived on to fight for that most elusive of needs in our time and place: gun control. Who can say that she was not raised to her own governmental high estate just for this? My Boubby the Philosopher was from an older time; she would have read her paper, first cheered that the shooter didn’t have a distinctively Jewish name, then turned to the sacred business of mourning the dead. Her Jewish dead, and all the others. And now, we must do the same, for all the others, but especially for our lost potential Esthers. We are all well aware of the side effects of power. It can intoxicate as well as corrupt. But can it cause brain damage? This is the question asked by author Jerry Useem in a recent article in The Atlantic (Power Causes Brain Damage, July/August 2017 issue). His conclusion, as the title of his article suggests, is that power, in fact, has the ability to alter one’s brain — and not all for the good. Much of the research on the impact of power on the brain was conducted by Dacher Keltner, a psychology teacher at the University of California-Berkeley, who discovered that subjects under the influence of power acted as if they had suffered a traumatic brain injury. They became more impulsive, less risk-aware and, crucially, less adept at seeing things from other people’s point of view. Sukhvinder Obhi, a neuroscientist at McMaster University, described something similar. When he put the heads of the powerful and the not-so-powerful under a transcranial-magnetic-stimulation machine, he found that power, in fact, impairs a specific neural process, “mirroring,” that may be a cornerstone of empathy. This presents a neurological basis for what Keltner has termed the “power paradox”: Once we have power, we lose some of the capacities we needed to gain it in the first place. So, what is it about power that causes such trouble? The research suggests that power primes our brain to screen out peripheral information. In most situations, this provides a helpful energy boost. In social ones, it has the unfortunate side effect of making us less sensitive to those around us. Keltner’s advice to the powerful is to remember that power is but a mental state. Recount a time you did not feel powerful and your brain can once again commune with reality. While Keltner’s research is indeed illuminating, his remedial suggestion appears less than promising. It would seem that a conscientiously minded person of power following Keltner’s lead would need a set time (or times) each and every day for “powerless” self-reflection in order to dispel the demons that lie in power’s wake. How likely, though, is someone to follow such an uncomfortable day-to-day formula? And even if they were to fastidiously follow that formula, would the results prove anything more than temporary reprieves from empathy deficit? As a rabbi whose primary source material is the Torah, it’s of great interest to me that Moses, one of the most powerful men to ever walk this Earth, never suffered from any degree of empathy deficit. Quite the opposite. From the moment of Moses’ maturity when he “went out to his brethren” to defend the anonymous Israelite suffering under the blows of his Egyptian taskmaster (Exodus 2:11-12), to his defense of the entirety of the nation of Israel at the sin of the Golden Calf (“And now if You would but forgive their sin! — but if not, erase me now from Your book that You have written”) (Exodus 32:32), until his very last breaths at the end of 40 years of leading the people through the desert and shouldering countless national trials along the way, Moses never tires of service. His empathy and sensitivity toward others never wane. As hard as it is for us to imagine immense power and exceeding humility paired as one, Moses’ experience teaches us that when one’s identity is centrally that of a servant of God, power is acquired with a healthy dose of perspective. For with every step toward greatness and Godliness (those traits which would foretell Moses’ power as a leader), there Moses encountered his Creator, and consequently a reckoning with his own mortality, inadequacies and limitations. Moses didn’t need to reflect upon moments of powerlessness to bring himself back to Earth. Moses’ entire existence was an extended meditation on his own vulnerability and ultimate powerlessness in the face of the King of Kings. We, too, experience powerful emotions of powerlessness when we pray each day. We are reminded that we are servants, not beings meant to be served, and we are reminded that all our gifts, our talents, and our power come from the source of all power. Who, then, are we to gloat? Perhaps more than anything else, the powerful need a religious awakening of sorts. Some God on the brain where the power used to be. The internet is wonderful for wondering Jews — so much information. I try to read as much as possible and, as I say to my adult students, find what works for you. To integrate Jewish practice into our lives, it must make sense on many levels. Just this week I read a blog by Laura Duhan Kaplan. She titled the piece “Pray Before You Post” and wrote about comments from people about her pieces. Words hurt — we have the Chofetz Chaim to teach us the many rules of lashon hara, evil speech. We say that gossip is a part of life, but does that mean it is OK to talk about others and share secrets? We could spend months, even years, studying the Chofetz Chaim, and yet does it help us control our words? Judaism is about action and words, but not about thoughts. Unfortunately often our thoughts come out of our mouths before we have thought it through, and now our fingers text, email and more without pondering a bit more. There is a blessing for everything in Judaism — the most important thing is not to remember the “right” blessing but to remember to bless. So imagine what the world would be if each person said this prayer just before hitting “send”? Laura Seymour is director of camping aervices at the Aaron Family Jewish Community Center of Dallas. 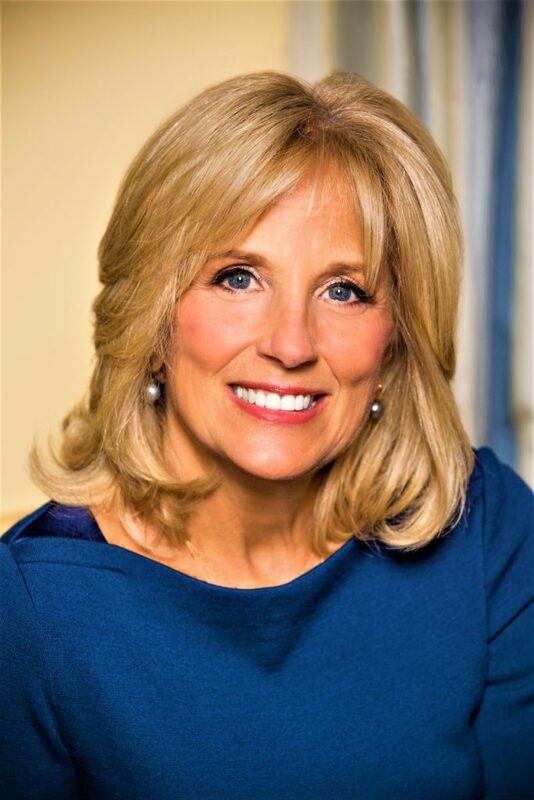 Dr. Jill Biden, an educator and wife of former Vice President Joe Biden, will be the featured speaker at Jewish Family Service’s Woman to Woman luncheon Wednesday, April 25, at the Hyatt Regency Dallas. The fundraising luncheon is open to women and men. A silent auction and registration will begin at 10 a.m., with lunch and the program slated for noon. Former WFAA-TV news anchor Gloria Campos will be master of ceremonies at the event. The event provides substantial support for services promoting lifelong self-sufficiency and well-being for anyone in need regardless of religion, race, ethnicity or ability to pay. Other co-chairs are Susan Frapart, Linda Garner, Sherry Goldberg, Julie Liberman, Beverly Rossel, Monica Susman and Laura Weinstein. Honorary co-chairs are Paddy Epstein, Ann Kahn, Lisa Kleinman, Ann Rosenberg and the JFS staff. Garner said the co-chairs are looking forward to Biden’s talk. Biden is a mother and grandmother, a lifelong educator, a proud Blue Star mom, and an active community member. As the nation’s second lady, she worked to bring attention to the sacrifices made by military families, to highlight the importance of community colleges to America’s future, and to raise awareness around areas of particular importance to women, including breast cancer prevention, all while continuing to teach English full-time at a community college. Inspired by her granddaughter, Biden also wrote the book Don’t Forget, God Bless Our Troops, a story through a child’s eyes of what family life is like when a parent is away at war. Participants in the event’s raffle, silent auction and live auction have a chance to win: tickets to Ellen; seven nights at a four-bedroom home in Cabo San Lucas; a Cartier watch; art pieces; shopping, sports, restaurant and entertainment packages; and more. Raffle tickets, $25 for one and $100 for five, can be purchased in advance by calling JFS. Prize winners do not need to be present. Tickets for the expected sellout event are available in sponsorships available at jfsdallas.org/woman, or by calling 469-445-0616 or emailing kstrull@jfsdallas.org. Individual seats, if space permits, can be secured online beginning March 1. For information or to purchase raffle tickets in advance, call 972-437-9950.